Colombia’s Caribbean city of Barranquilla announced details for their February carnival, sparking anticipation for one of the world’s biggest carnivals. The 2016 edition of the carnival will be rammed with kings, queens, extravagant costumes, music and dancing for four days from February 6, following a round of pre-carnival warm ups in January. Barranquilla, also known as the Golden Gate of Colombia because of its function as the passageway for goods and people in to Colombia in the nineteenth century, is located in the northern coast of Colombia where the Magdalena River meets the Caribbean sea. 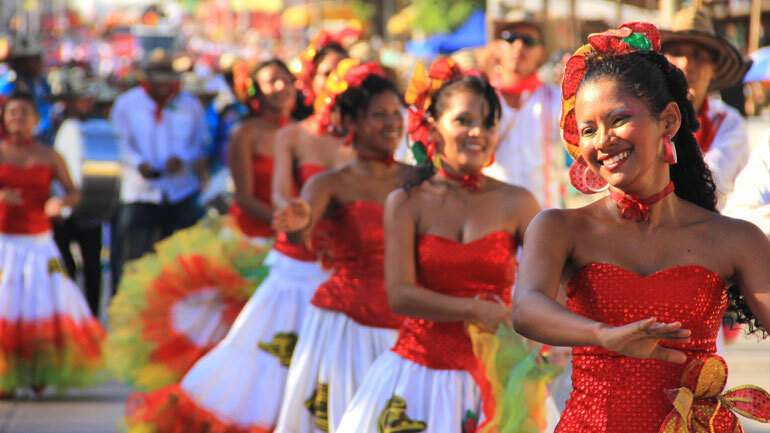 Its annual carnival, which has been labelled “the most representative carnival of the Caribbean”, is also recognized by UNESCO as a Masterpiece of the Oral and Intangible Heritage of Humanity. From January 15 Barranquilla will be in pre-carnival mode, with a variety of events scheduled to take place around the city up until the last day of the month. On Friday 22 for example, the Magdalena football ground will present “Friday’s Queen and Orchestra” event, which will see around 20 orchestras compete for the 2016 Orchestra Festival cup. Other events include the “Big Coronation Night’ on Saturday 30 where both the child and adult kings and queens of the carnival will be crowned, followed by the children’s carnival parade on the Sunday. The main event just before the carnival gets in full swing will see the coronation of the overall queen of the carnival, which will take place in the Romelio Martinez Stadium on February 4. Once the major celebrations start on February 6, Barranquilla’s streets will be flooded with four days of massive, brightly coloured, loud parades centred around traditional themes, music and dancing, accompanied by orchestral and comedy festivals until Tuesday 9 February. Not only does the almost three-month premature release of the timetable demonstrate how highly regarded and looked forward to this event is in Colombia, but also the fact that on the event’s official webpage, the exact dates of the carnival are listed up until 2040.